Follow in our founding fathers' footsteps and brew some all-American hard cider with this easy kit. Hard cider is as American as apple pie. The Pilgrims drank it, as did George Washington, Ben Franklin and Thomas Jefferson. Then came Prohibition and lots of burned apple orchards. A century later, though, home brewers are excited about hard cider again, thanks to the craft spirits revolution. Becoming a ciderist is easy: All you need is the pasteurized cider of your choice (as long as it doesn't contain preservatives like potassium sorbate or sodium benzoate, which kill the yeasts that do the fermenting) and this kit. Follow a few simple steps, let nature do its work, and a subtle, sparkling dry cider will be your reward. Maybe this is what the Founders meant by "the pursuit of happiness." Assembled in New York. 4-5% ABV. - 3 packets of sanitizer. Includes enough ingredients to make three batches of hard cider. Hard Cider Kit is naturally gluten free. A great product that comes with everything you could need. Unique and fun experience to brew with a loved one. Started using it this weekend - was a breeze! #sweepstakes This product was easy to use and an excellent gift! He said it was really easy to use and was able to add his own "flair" to the cider. The end product tasted great! 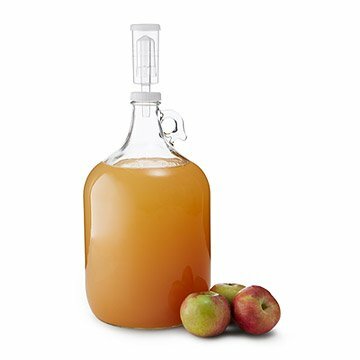 Great gift for a novice brewer who likes cider.